Did you know that Islam has end-time prophecy? Did you know it tells of a figure who will rise to power and attempt to rule the world with the help of another figure, both of whom will be empowered and given authority by an infamous, supernatural being? Did you know these same figures are also mentioned in Christian prophecy? Did you know Islamic end-time prophecy is the exact opposite of Christian end-time prophecy? Islamic end-time prophecy has an Antichrist figure just like Christian end-time prophecy. It calls him the Dajjal. But in Islam, the Antichrist figure, or the Dajjal, will return and fight for Israel against the invading Muslims. Who does the Dajjal sound like to you? 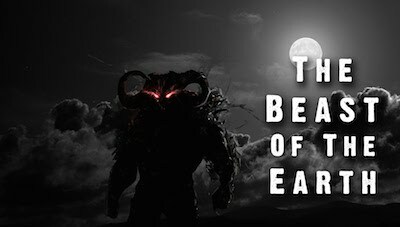 Below is an Islamic video on the Muslim teaching of the Beast from the Earth. Before you watch the video, it would be helpful to learn some vocabulary. The Dajjal is Islam’s Antichrist figure. According to Islam, the Dajjal will return and claim to be Jesus Christ. He’ll claim to be divine and He’ll fight for Israel. The Dajjal is actually the biblical Jesus Christ who returns as the King of kings. When the video refers to the Dajjal, or the Antichrist, it is really referring to the biblical Jesus Christ. The Mahdi is Islam’s awaited messiah. Muslims believe he will come to help them defeat the Christians and the Jews at the time of the end. He will attempt to rule the entire world. The Mahdi is the biblical Antichrist. Isa is Islam’s Jesus figure. Muslims believe Jesus was a great prophet but they do not believe He was the Son of God or Savior of the world. The Muslim Jesus will “return” and deny he ever said he was God. He will join together with the Mahdi. He will teach people about Islam and eventually direct people to worship the Mahdi. He is obviously not the real Jesus. The Muslim Jesus is the biblical False Prophet. Read through these again if you have to and then watch the video. You can also skip straight to the sections I’ve highlighted below if you want. @4:39 “But its signs have already come… this is Allah talking to us brothers and sisters. Allah’s saying to us, what are you waiting for? Are you waiting for the major signs? To come and hit you? Because there’s nothing left but the major signs!! @4:54 “Are you waiting for the Beast of the Earth? To come and slap your face or mark your face with the word “believer” or “disbeliever”? @ 5:45 “When it sees the believer, this speaking beast… it will adorn the believer’s face, by writing the best word that can ever be written, it writes on his face… “believer”! @ 12:02 to the end it teaches about the Dajjal, or Islam’s Antichrist figure who is the biblical Jesus Christ. @ 18:15 it mentions Al-Mahdi, or what the Bible calls the Antichrist. Then I saw another beast coming up from the earth. He had two horns like a lamb, but was speaking like a dragon. He exercised all the ruling authority of the first beast on his behalf, and made the earth and those who inhabit it worship the first beast, the one whose lethal wound had been healed. He performed momentous signs, even making fire come down from heaven in front of people and, by the signs he was permitted to perform on behalf of the beast, he deceived those who live on the earth. He told those who live on the earth to make an image to the beast who had been wounded by the sword, but still lived. The second beast was empowered to give life to the image of the first beast so that it could speak, and could cause all those who did not worship the image of the beast to be killed. He also caused everyone (small and great, rich and poor, free and slave) to obtain a mark on their right hand or on their forehead. Thus no one was allowed to buy or sell things unless he bore the mark of the beast – that is, his name or his number. This calls for wisdom: Let the one who has insight calculate the beast’s number, for it is man’s number, and his number is 666. This can be confusing at first, so let’s look at it again. Just remember that Islam teaches the exact opposite of Christianity. The Islamic perspective: The Dajjal will return and fight for Israel against Islam but he will be defeated by the Mahdi who is Islam’s Messiah figure. The Christian perspective: Jesus Christ will return and fight for Israel against Islam and he will defeat the Antichrist. According to the Bible, who is the Dajjal? According to the Bible, who is the Mahdi? In Islam, the Mahdi and Isa are in league with Allah. In Christianity, the Antichrist and the False Prophet are in league with Satan. Who does that make Allah? Reading Mideast Beast and Gods War on Terror again. My question is who you say is the False Prophet…the Muslim Jesus. I thought that was Mohammed? Mohammad was certainly a false prophet, but THE False Prophet at the end of the age will be Isa, the Muslim Jesus. Muslim’s say he will accompany their Mahdi, our biblical Antichrist. we know Jesus is the Lamb. this False Prophet has horns like a lamb but spoke as a dragon meaning he is a false Jesus. This article is an eye opener. God bless the writer. Excellent teachings! Keep it going further, God bless you. Whouw we are not living in a fanasy world boys. This is why there is war. look to the bloodshed ad not to a roman fantasy world. This website is the closest thing I’ve found on the book of Revelations, please check this out!